Throughout my dance career, I’ve been a student many times. Each experience has been extremely rewarding and even though I now teach I really love the feeling of having a fresh, open mind. Today I still consider myself a perpetual student and, each time I step into the classroom, I always remember the five tips below. These were passed on to me by several of my dance mentors, and I’d like to share them with you to help you along your dance journey. 1. Maintain a Student’s mind – Whatever your level, whether brand new beginner or advanced pro, maintaining a Student’s mind is imperative for success in bellydance. As a Student, you are open to trying new things and also working to progress. You understand that things may not come instantly and may require practice and work to achieve and, to be honest, that’s part of the fun! 2. 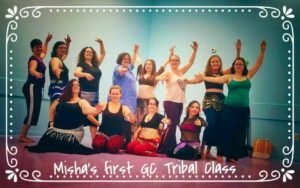 Curb the competition – Your bellydance journey is exactly that – YOURS! Enjoy the amazing way each move feels in your body and don’t worry about another’s story. Rejoice in your own pathway and discoveries and do not compare yourself to others in class. Celebrating your own unique abilities will help you continue to find joy in the dance for years to come. 3. Ask questions – Be brave in class and speak up! If you need clarification or want to know how exactly to do a move be sure to ask. Your question will most likely clarify something for someone else, and you’ll get the benefit of getting the answer too. 4. Skip the full costume – Bellydance gives us the opportunity to dress up, costume, and become incredibly beautiful inside and out. It’s super fun to come up with creative costuming, but this is not always appropriate for class. While we do host costume nights for special holidays and once each session for fun, keep in mind that heavy costuming can impede your progress in class. Make sure that whatever you wear enables the teacher to see your body and movements so that she or he can help instruct and guide you. 5. Respect your Tribal Sisters – Whether the Sister is your Teacher or another Student, our Tribe is founded on respect. While in class, be considerate of one another’s time and learning process. Keep those zils quiet while the teacher is talking so everyone can hear. Don’t interrupt other Students or the Teacher. If you have to come late hey, life happens, but come in quietly and respectfully. Your actions will help maintain the atmosphere of the class, making it a fun and wonderful experience for all who come to share in this beautiful dance.